Happy Birthday Ludwig von Beethoven. The "quality control" sledge hammer has been busy singing its song . . . yielding nine buckets of shards for the dumpster. 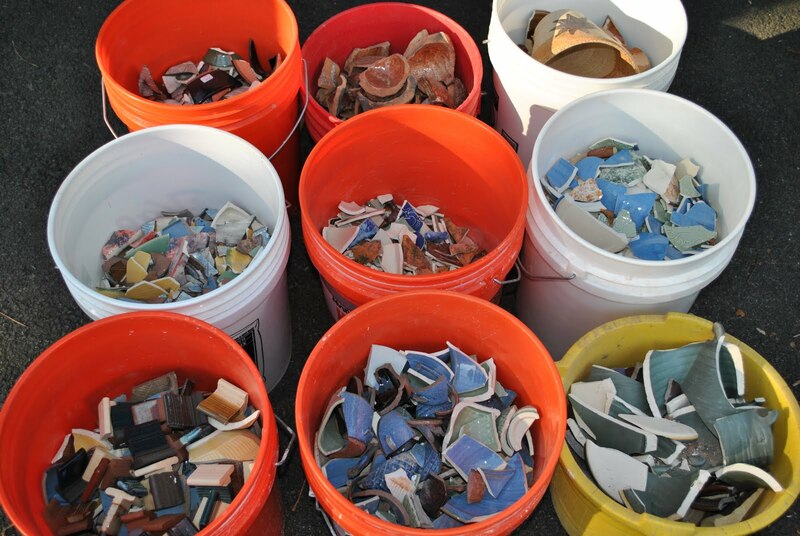 These were unsellable/ungivable pots (S-cracks, cracks in rims, platters that warped, glaze defects, cups with elephant ear handles, etc). The collection had been accumulating over the past two or so years. The first time I did this, it was very difficult. Somehow, you wanted to keep everything. But deciding to sell my pottery made me raise my standards and expectations for finished pieces -- they all have my name on them. So, I see this now as a necessary part of the craft, one that is part of moving forward. I've also become better at intercepting "bad" pots at an earlier stage where the clay can be reclaimed, rather than firing items I know will not meet my standards for sale. Besides, now that the shelves are almost bare, I can make more pots. Watch for future posts. 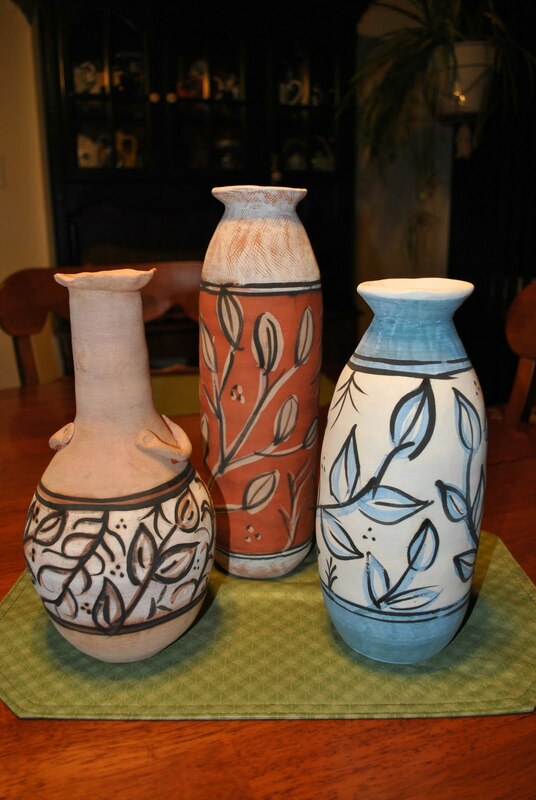 Here is the collection of vases made during my handbuilding class with Alfredo Ratinoff at the Smithsonian Institution. All construction is by coils. Decoration is by engobes. Once fired to cone 04. The blue/white vase is made from Little Loafers stoneware from Highwater Clays; the other two are made from Standard 104 earthenware clay w/grog. Not having done much (any) serious coil-building before, I am pretty satisfied with the results. I particularly like the texture and feel of the fired surfaces. I am undecided about whether or not to put a wax or other finish to the outsides. Until I decide, I'll enjoy them as they are.